A sure sign that the highly-anticipated spring marathons are coming to cities like Boston and London is the number of high-quality half-marathon races that have recently taken place around the world. Many of the leading marathon runners use these opportunities to test their form in “the half” as a way to prepare for the spring classics. This year’s highlight performance has been that of Kenya’s Florence Kiplagat, who sent a stunning message by improving her own world record at the Barcelona Half Marathon for the second year in a row. Congratulations to those of you who have run an early-spring race and we wish those who are preparing for a marathon all the best and much success in your remaining training. We will be keeping our fingers crossed for you! And here is our review of some of the top half marathons run in recent weeks. 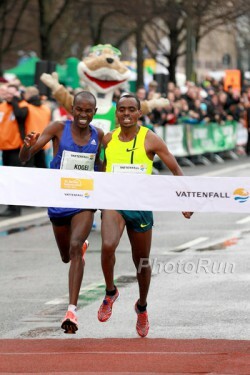 An Ethiopian newcomer caused the surprise of the day at the 35th Vattenfall Berlin Half Marathon. After a thrilling sprint to the finish line, 21-year-old Birhanu Legese, in his debut “half,” was the winner in 59:45—just one second ahead of Kenya’s David Kogei. Third place went to the pre-race favorite Abraham Cheroben (Kenya), who clocked 59:49. Another Kenyan runner, Richard Mengich (59:59), also broke the one hour-barrier amidst windy weather in the German capital. “I was confident that I would win, because I know that I have very good speed. But once we crossed the line, I was not so sure,” said Birhanu Legese. Kenya’s Cynthia Kosgei was victorious in the women’s race with a time of 70:52, defeating her compatriot Elizabe Cherono (70:56) and Isabellah Andersson of Sweden (71:31), who led until the 15K mark. More than 32,000 runners from 106 nations registered for the race. The Ethiopian contenders achieved a double in the women’s race. In spite of windy conditions, Worknesh Degefa, who won the Lisbon Half Marathon last year, ran a strong 67:14 minutes—the fifth-fastest time of the year. She improved her personal best by 35 seconds and took the title ahead of Yebrgual Melese (68:21) and Diane Nukuri of Burundi (69:33). ”My goal was to run a time between 66 and 67 minutes, but it was a hard race,” said the 24-year-old Worknesh. “It was not only the tough competition but also the wind. And then there were sections of cobblestones which I found difficult to run on.” More than 12,000 runners registered for the event. One day before his 32nd birthday, British Olympic gold medalist Mo Farah set a new European record at the 25th edition of the Lisbon Half Marathon. The Olympic champion over 5,000 and 10,000 m won in 59:32—just one second ahead of Kenya’s Micah Kogo. Third place went to another Kenyan athlete, Stephen Kibet, with a time of 59:58. In the women’s race, Kenya’s Rose Chelimo ran to a clear victory in 68:22 minutes, with Sara Moreira of Portugal second in 69:18. Third-place went to Priscah Jeptoo of Kenya, who finished in 69:21 as she prepared for the London Marathon. Molly Huddle of the United States was the surprise winner in the United Airlines New York City Half Marathon, setting a course record of 1:08:31. Kenya’s Leonard Korir was also an unexpected winner in the men’s race, sprinting to the finish in 61 minutes and 6 seconds. At 20 kilometers, Lusapho April of South Africa and Mexico’s Juan Luis Barrios fell out of contention, leaving Leonard Korir and fellow Kenyan Stephen Sambu to duel all the way to the finish line. Leonard managed to find an extra gear in the last few meters to overhaul Stephen and win by one second. “I always had a strong kick so I knew I had a chance,” explained Leonard, who was not regarded as one of the pre-race favorites. Juan Luis Barrios finished third in 61:14 and Lusapho April fourth in 61:21. Molly Huddle dominated the second half of the women’s race. The 30-year-old, who finished sixth in the 5,000m in the 2013 World Championships, went in with a half-marathon best of 69:04. Molly’s surge in pace forced the defending champion and course-record holder, Sally Kipyego, as well as her Kenyan compatriot, Caroline Rotich, to drop back. 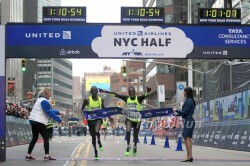 In the closing stages, Kenya’s leading runner, Joyce Chepkirui, also fell behind as Molly became the first American to win the women’s title at the New York City Half Marathon—a personal best performance that set a new course record of 1:08:31 and established her as a new hope for the United States in road running. “I felt good and had prepared well,” she said afterwards. “The field was strong—winning this race is great for me.” Joyce Chepkirui was second in 1:08:42. Third place went to Sally Kipyego in 1:09:39, while Caroline Rotich finished fourth in 1:09:53. Race-day temperatures in New York City were a cool 42 degrees Fahrenheit for the 19,455 finishers. Among them were 400 runners taking part in the “NYRR Team for Kids,” who raised money for children’s health and fitness programs. 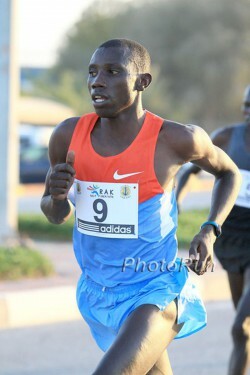 Stanley Biwott of Kenya won the NN CPC The Hague Half Marathon in 59:20—the world’s fastest time this year. Preparing for the London Marathon, the 28-year-old left his rivals behind by the 12-mile mark. Stanley has a PR of 58:56, and finished second in the London Marathon last year. Two other runners also went under the 60-minute barrier: Cyprian Kotut finished second in 59:28 and his fellow Kenyan Edwin Kiptoo took third with 59:35. The Kenyan competitors were very strong in this race, which is renowned for its fast times. 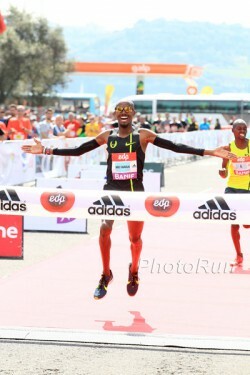 Fourth place went to Eliud Tarus in 60:04, one second ahead of Bernard Kimani. Switzerland’s Maja Neuenschwander was the winner in the women’s race, in which there were no leading African contenders. Her winning time of 1:11:08 was followed by Gezashign Gemeda of the Netherlands in 1:12:41 and another Swiss runner, Fabienne Schlumpf, in 1:13:56. 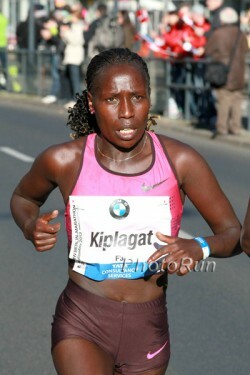 Florence Kiplagat has done it again! The amazing 27-year-old Kenyan improved her own world record in Barcelona by three seconds—crossing the line in 65:09. A year ago, she clocked 65:12. Her race splits between 15K and 20K also set a world record and her impressive performance is a good indicator of her fitness in advance of the upcoming London Marathon. Last November, the Association of International Marathons and Distance Races (AIMS) named Florence as the Female Marathon Runner of 2014 and her Barcelona performance has made her spring marathon in the British capital in April all the more eagerly awaited. Just like last year, Florence found herself the only world-class runner in the women’s field and so was able to concentrate fully on her world-record attempt. Trained by the well known Italian coach Renato Canova, she went through 10K in 31:02—a time few have been able to run when racing just this distance. In this race against the clock, she passed 15K in 46:14—well inside the world record of the multiple Olympic champion Tirunesh Dibaba of Ethiopia. Tirunesh ran 46:28 in Nijmegen, in the Netherlands, in 2009 in what is admittedly a rarely run distance. Florence then reached 20K in 61:54—two seconds faster than her world record last year—and finished in 65:09, almost nine minutes ahead of Ireland’s Elizabeth Lee (74:06) and Charlotte Karlsson of Switzerland (75:25). Victory in the men’s race went to Tadese Abraham, who is running for Switzerland. He set a national record of 60:42, followed across the finish line by his Ethiopian rivals Getu Feleke (60:45) and Azmeraw Mengistu (60:48). 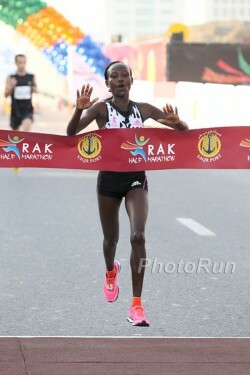 Mary Keitany of Kenya won this year’s edition of the Ras Al Khaimah Half Marathon in the United Arab Emirates in 66:02—the third-fastest performance ever at the time on a course that conforms to official-record regulations. The runner-up, Mamitu Daska, who will compete Boston in April, set an Ethiopian record with 66:28 and two more women broke 68 minutes: Cynthia Limo, who was third in 67:02 and fellow Kenyan Josephine Chepkoech—fourth in 67:32. Mary Keitany proved yet again that she has regained her best form after having her second baby, and the 33-year-old plans to run the London Marathon on April 26. The men’s field at Ras Al Khaimah was not as strong as in previous years. Nevertheless, the race turned out to be just as exciting. Ethiopia’s Mosinet Geremew defeated Daniel Wanjiru of Kenya by just one second in 60:05. 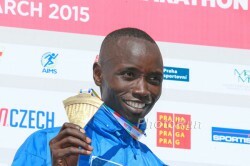 Jonathan Maiyo of Kenya finished third in 60:08. Another Kenyan athlete, Eliud Kipchoge, a favorite for the London Marathon, was using the race as a build-up and took sixth place in 60:50.